•	Management: Scheduling: Customize shut down and reboot of connected equipment and UPSs. •	Data logging: Identify problematic trends before they escalate or export the data log for analysis. •	Event logging: Pinpoint the timing and sequence of events leading up to an incident with the event log. •	Run command file: Run command file on shutdown sequence as well as start-up sequence. •	Remote UPS management: Enable management of your UPS by connecting it directly to the network. •	Browser Accessible: View the user interface with a browser. Provides quick access from anywhere on a secure network. •	Enterprise management system compatible: Manage your APC devices from a single system by forwarding SNMP traps (events) to your preferred enterprise management system. •	Reboot equipment remotely: Saves dispatching technicians to remote locations. •	Operating System Shutdown: Prevents possible data corruption by performing graceful, unattended operating system shutdown in the event of an extended power outage. •	Security Features:	Password Security: User-selectable password protection prevents unauthorized access. •	Three-tier user access: Control user access on three levels including read only, device and administrator. •	Radius support: Use an existing radius server to securely authenticate, authorize, and account for your APC device. 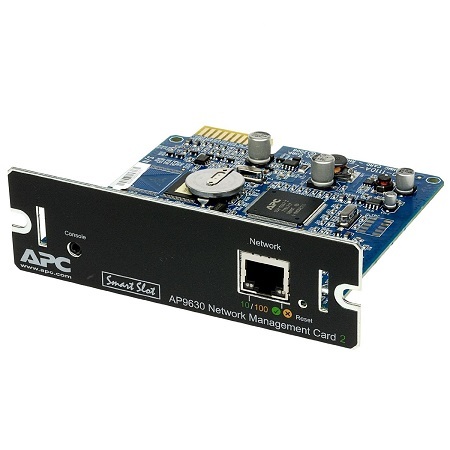 •	PowerChute Network Shutdown: Reliable network-based shutdown of multiple servers.